Ultimate Fighting Championship star Conor McGregor was charged with three counts of assault and one count of criminal mischief after an alleged bus attack, the New York Police Department said Friday. Bail for the fighter was set at $50,000. Police arrested McGregor following the incident Thursday at the Barclays Center in Brooklyn. McGregor allegedly threw something through the window of a minibus, injuring a passenger, according to an NYPD source with knowledge of the event. CNN could not reach McGregor's team for comment. UFC president Dana White told the website MMAjunkie that a member of a credentialed website let McGregor and his entourage of about 20 people into the arena through a door during a media day event. The group went down to the loading dock where some fighters who were to participate in UFC 223 on Saturday were getting on buses. McGregor's group attacked a bus using trash cans, metal barricades and a two-wheeled dolly, White said. "This is the most disgusting thing that has ever happened in the history of the company," White told MMAjunkie. "This was a real bad career move for him," White said. White said McGregor had "some sort of beef" with lightweight fighter Khabib Nurmagomedov, who was on the bus. Another fighter on the bus, Michael Chiesa, suffered head and facial cuts from broken glass, White told the website. Chiesa later said on Twitter that the New York State Athletic Commission determined he would not be allowed to fight on Saturday. "The organization deems today's disruption completely unacceptable and is currently working on the consequences that will follow," UFC said in a statement . Flyweight Ray Borg, who was scheduled to face Brandon Moreno, is also unfit to fight due to multiple corneal abrasions, according to the UFC. "Also removed from the card was the featherweight bout between Artem Lobov and Alex Caceres due to Lobov's involvement in the incident," the UFC said. It did not provide details on Lobov's role in the incident. "UFC 223 will proceed as scheduled with 10 bouts," the UFC said. "Moving to the Pay-Per-View main card is the featherweight bout between Zabit Magomedsharipov and Kyle Bochniak." According to Bleacher Report, McGregor (21-3) last fought for UFC in November 2016, when he won the 155-pound championship. Nurmagomedov is fighting for the 155 title Saturday, after White said earlier this week McGregor would no longer be permanent champ, according to the Washington Post . 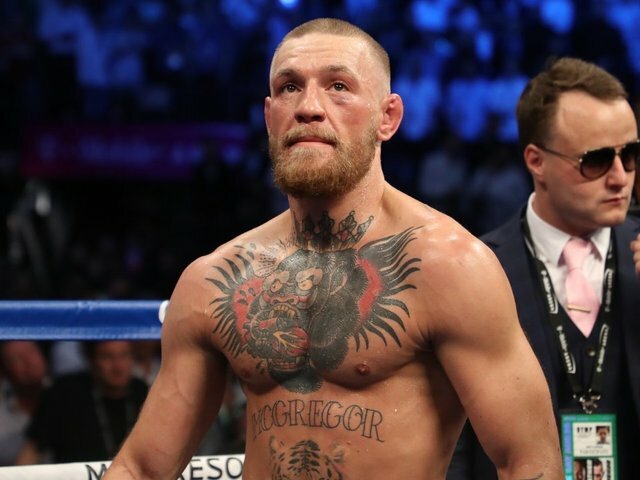 McGregor last competed eight months ago, losing to undefeated Floyd Mayweather in a boxing match that reportedly paid Mayweather more than $100 million and McGregor at least $30 million.